The 2018 PositiveNaija Essay Competition aims to encourage Nigerian patriotism, nation building as well as a platform for excellence! THE LOVE OF A NIGERIAN! Inform the world through your essay, what genuinely makes Nigeria and Nigerians kind, cooperative, tolerant and well-meaning towards one another and humanity today. At the beginning or end of the essay, state only your full names, nationality, email and telephone number(s). Truth, logical consistency, facts, narrative structure/organisation, creativity/initiative. 1st – 10th positions: Essays are published weekly on the blog. Submission dates by participants: 1st June 2018 – 31st July 2018 (SEE ANNEX 4 for status of entries). PositiveNaija review and submit Top 10 best entries to Advisory Judges: August 1 – 10, 2018. Blind review by Advisory Judges who shall [individually] assess, grade and rank the entries: August 11 – 31, 2018. Decision of Top 3 entries by Advisory Judges are published (without ranking) on the Competition Page: 3rd September 2018. 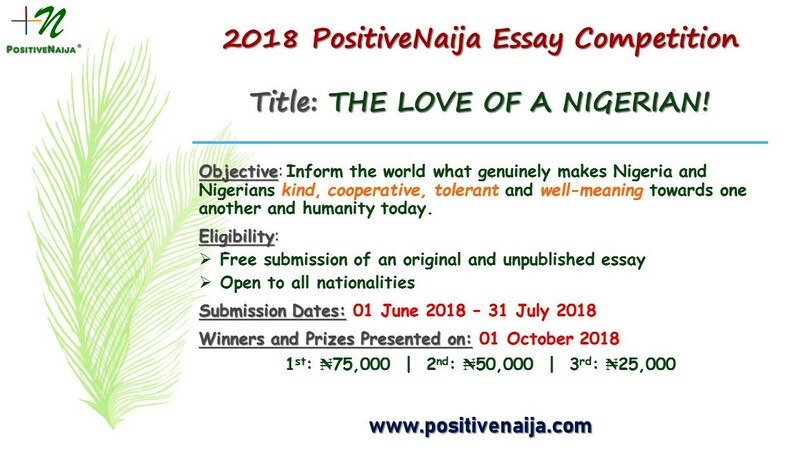 We welcome sponsorships for the 2018 PositiveNaija Essay Competition. Identifying, supporting and partnering with us on this competition is a testament to your personal, institutional or corporate conviction on the greatness, development and potentials of Nigeria/Nigerians. For transparent and accountability purposes, every sponsorship for this competition received shall be made available on the blog [for privacy, sponsors can choose to use the initials of their names] (SEE ANNEX 3 below). We shall also provide up-to-date progress report to you. General/Overarching – If your support is targeted to the general/overarching running of the competition, we will ensure equity in its distribution to the entire competition process. We are committed to making the PositiveNaija Annual Essay Competition, the most rewarding educational prize competition in Nigeria by the year 2022.